The wanted suspect was spotted outside community of Barkan in Samaria. Four Bedouins arrested for attacking motorists on Highway 40. A terror suspect was arrested Friday morning outside the community of Barkan in Samaria. A security man working for a private firm – Tzevet 5 – noticed the man, who aroused his suspicion. The security man approached the suspect and found that he lacked an entry permit, looked “strange and scared” and was sweating. The guard at the gate began questioning the suspect, who turned himself over to the guard after a short while. Meanwhile, security forces arrived on the scene and confirmed that the suspect was indeed a wanted terrorist. They arrested him for interrogation. Four Bedouin Israelis, two adults and two teenagers, have been arrested for allegedly attacking motorists on Highway 40 in the Negev. All four are from the city of Rahat. Police suspect the group of firebombing Israeli drivers. They have been accused of organizing with intent to commit terrorism and endangering human life on a public roadway. The four were arrested in April, but the affair was under gag order until Friday. Some details of the case have not yet been released for publication. In April, the Israel Security Agency revealed that an Arab citizen of Israel was arrested for firebombing the town of Mei Ami. 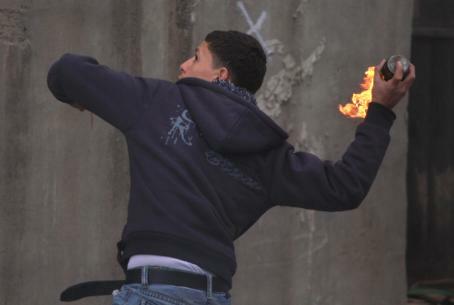 The man, a resident of Umm el-Fahm, threw firebombs at the fence surrounding Mei Ami on two occasions. Firebomb attacks are common on roads in Judea and Samaria, and have occasionally caused serious injury. A father and his baby son were wounded in a firebomb attack on Highway 443 in March, and a teenage girl was moderately wounded in a firebombing attack near Hevron in December 2009.